The April 2016 issue of Safari – a knowledge and science magazine from India – Gujarati Edition – is out quite on time and here are our personal views and reviews for the same. Cover page of any magazine (or book or even any other media for the matter of fact) is very essential segment of the same. Of course as per the famous saying We should not judge the book from its cover; but in practical life, in majority of case, we open/purchase/enquire/attracts toward any media based on its first impression, i.e. cover. That’s why the cover page plays a very important role for any magazine. The cover page of April 2016 issue of Safari -Gujarati is balanced in terms of color combination, attractiveness and it is informative about the content inside at the same time. The second and very important aspect for any magazine is it’s editorial. We say it in almost all our magazine review article. It creates a link between the readers and the editor. It not only conveys the editor’s perspective about the content of the magazine but also gives him chance to talk about what it is missed due to various reasons to be included into. By referring various scenes from the famous movie Jurrasic Park, Harshal Pushkarna starts his details article about various animal who have enormous compressive power in their Jaws. The article goes in detail and lists out the power of Jaws (compressive pressure they can produce in kgs per square CM) for the following animals. The language of this article is interesting and the information is presented nicely. Here is one more video you would like to view to know more about this topic. INS Viraat is Indian Navy’s flagship is about to be retired and converted into a hotel then. This battle ship have payed a remarkable role in guarding India during it’s effective duty time. Harshal Pushkarna’s article on it comes as a kind of “biding adiue” to INS Viraat. In addition to have some fantastic photographs showing it in action and its might, the article brings in some interesting information about it. And the information’s historical time span is expanded to the days when it was called “Hermis” (when serving British) to modern days. We though wish that the article could have been more detailed. During Persian Gulf war of 1990 Air India have executed successfully an operation to evacuate around 170000 people by Airlifting. It is very easy to comment on and discuss about such operation by sitting in the comfort of home or office. However when actual wars are happening the situations are very dangerous. No one usually gets ready to drive a car or fly a plane to the areas even slightly dangerous. During such toughest situation the pilots who went into war zones to rescue their fellow countrymen requires appreciation. Also there came many controversies around the movie claiming that many facts are misrepresented in the movie. The movie on the other hand is a fiction and inspired from true events, that is it. It have taken cinematic liberties and added fantasy stuff; but this however doesn’t affect the merit of the actual operation (or even movie in a certain extent). 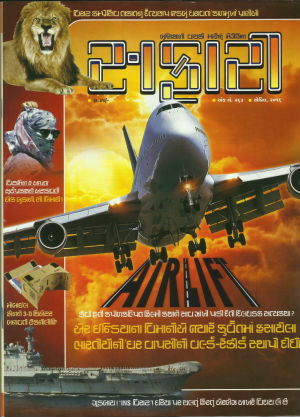 You can follow 1990 airlift of Indians from Kuwait article to get briefing about this operation. A man named Mathunny Mathews played a remarkable role in this operation, and was the hero of the same. There is a very detailed article on this operation in this issue which is worth reading. The article is spread over 15 pages with information and rare photographs. The article is written by Nagendra Vijay in his unique style which will keep you glued through out (reading the same). If it was the only article in this issue, than also the magazine was worth going for. Our passion for 3D stuff is very old right? We love 3d models and movies. And with the advancement in Virtual Reality techniques, we are enjoying (and hence starving for) more in this arena. Just like it happens in many areas, various companies have played a key role in the development and availability of various weapons for the Indian Armed Forces. The companies however didn’t get that much public appreciation for the same. And of course, there are many things which needed to be kept private for the security reasons. Nagendra Vijay came with a detailed article about these companies. This section answers the following questions. It is said that Mount Everest grows vertically 2MM every year; why it is then just 8848 meters tall despite of having in existence since 4.5 crore years? Why there are so many advertisements about “clean your hands” (in India)? What is the cost of sending one astronaut to the space station? Why the cooling tower of thermal power plant have a Hyperboloid shape? Why it is not possible to stop or prevent every terrorist attack? Can the umpire or match-referee be penalised for making a mistake (in the game of cricket)? Why countries like USA buys remote sensing photographs from ISRO, as they are having their own satellites? What will be the benefits of “Digital India” to the common man? One more important article is focused on health, especially Vitamin – D. The changing lifestyle makes people to consume less Vitamin-D which is coming directly from sunlight. It is a very dangerous trend, and lead to many problems. The article should not be missed.